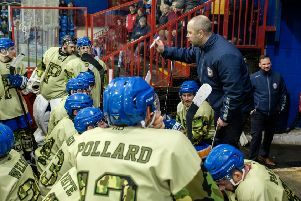 Peterborough Phantoms coach Slava Koulikov told his players to hold their heads up high as the club’s season came to an end last night (April 2). The city men were beaten 5-2 at table-toppers Guildford in their final English Premier League Play-Offs Group A fixture. Owen Griffiths (centre) was man-of-the-match for Phantoms at Guildford. Phantoms arrived in Surrey needing to sink the Flames and also relying on Sheffield Steeldogs could cause an unlikely shock in Telford. Even though Slava Koulikov’s men led or were level with their hosts for much of the opening two periods, it was soon clear that there would be no miracle elsewhere with Telford eventually easing to an 8-0 win to secure second spot and a place in the finals. And the knowledge of that scoreline almost certainly led to Phantoms being brushed aside in the final session by Guildford as they conceded three unanswered goals. Koulikov said: “I have thanked every single player for the commitment they gave to the Phantoms organisation for the past seven months. They have done magnificently well when all factors are taken into account. Scott Robson scored for Phantoms at Grantham. “I know that right now the guys probably don’t feel that way, but when they look back over time they will realise what they have done and should be proud of it. “I’m certainly proud of them. We met our target in the league and came within one penalty shot of silverware in the cup despite suffering more injuries than I’ve ever known a team to have in one season. “We also went into the last game of the group stage with hope of reaching the play-off finals. “In the end we couldn’t get the result we needed, and even then we would have needed another result to go our way. “We set ourselves the goal to get eight points in the group and we unfortunately fell just short of that. Phantoms fell behind to an early David Savage effort after the Guildford defenceman was allowed to carry the puck into the offensive zone. Darius Pliskauskas levelled within three minutes and Phantoms completed a first period turnaround when Scott Robson struck. Andy McKinney levelled for Guildford with the only goal of the second session and he then put his side back on top 20 seconds into the final stanza. A Tom Duggan strike extended the advantage before Ben Campbell burst through short-handed to put the result beyond doubt. Guildford, Telford, Milton Keynes and Basingstoke will now contest the play-off finals in Coventry this weekend (April 8 and 9). For Phantoms, the focus shifts to 2017/18 and assembling a competitive roster in a new-look second tier with fewer imports and which is expected to feature just seven teams.